It’s not uncommon to hear about vandalism in big cities and small towns, but most people expect to hear about graffiti, broken windows, or something similar when they think of vandalism. For Sioux City, Iowa, the form of vandalism that hit their town had far-reaching consequences beyond washing walls or repairing busted car windows. It could potentially mean the loss of a family’s livelihood, and it most definitely means the loss of thousands of innocent bystanders—specifically honeybees. These vandals knocked over dozens of hives over into the snow, killing half a million honeybees in addition to equipment the beekeepers kept in a locked supply shed. As of December 30, LaCroix surpassed his goal of $24,000, bringing in over $28,000 in donations. 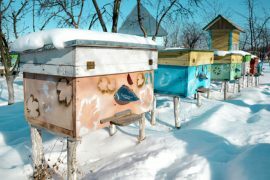 According to the Engelhardt’s, they hope to restock their hives in the spring and are currently salvaging anything they can. They’re hoping to resume their honey sales by 2019, which the many donations they’ve received will surely help with.